be prepared for people to rally around your words and position of authority. conversations on Facebook oscillate between feeling intimate and public, and it is easy to forget that the conversation is circulating until people start ‘liking’ and coming to bat for you without your prompting. this unexpectedly happens at the conclusion of the thread. as an aside: while this is a rather predictable aspect of public dialogue, at what point does this brigading put the other party so much on the defensive that they start to think they’re just not cut out for this kind of civic engagement? 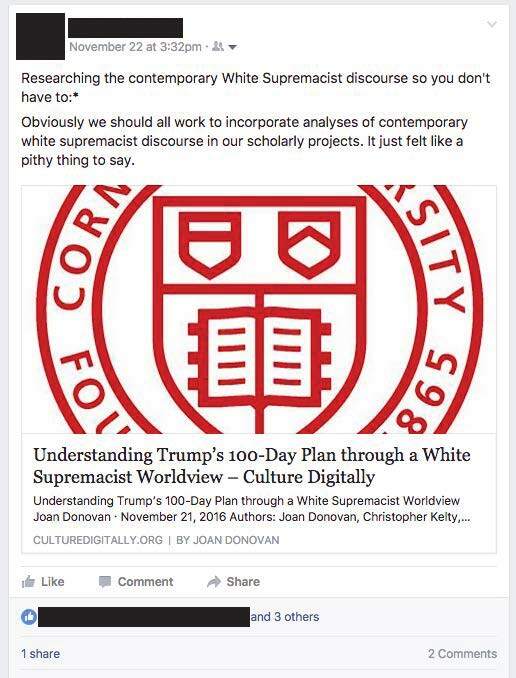 Obviously we should all work to incorporate analyses of contemporary white supremacist discourse in our scholarly projects. It just felt like a pithy thing to say. I comment (tagging Auntie in the post): [Auntie] you might find this interesting. This is authored by several researchers from different institutions, both academic and corporate. 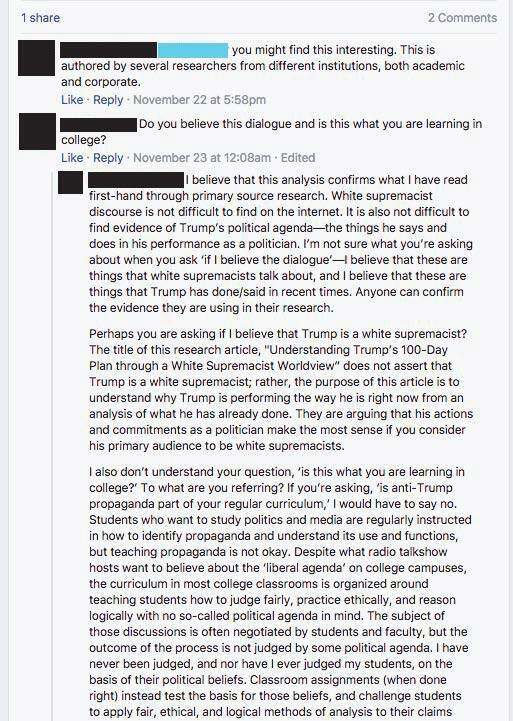 Auntie responds: Do you believe this dialogue and is this what you are learning in college? I respond: I believe that this analysis confirms what I have read first-hand through primary source research. White supremacist discourse is not difficult to find on the internet. It is also not difficult to find evidence of Trump’s political agenda—the things he says and does in his performance as a politician. I’m not sure what you’re asking about when you ask ‘if I believe the dialogue’—I believe that these are things that white supremacists talk about, and I believe that these are things that Trump has done/said in recent times. Anyone can confirm the evidence they are using in their research. Perhaps you are asking if I believe that Trump is a white supremacist? The title of this research article, “Understanding Trump’s 100-Day Plan through a White Supremacist Worldview” does not assert that Trump is a white supremacist; rather, the purpose of this article is to understand why Trump is performing the way he is right now from an analysis of what he has already done. They are arguing that his actions and commitments as a politician make the most sense if you consider his primary audience to be white supremacists. I also don’t understand your question, ‘is this what you are learning in college?’ To what are you referring? If you’re asking, ‘is anti-Trump propaganda part of your regular curriculum,’ I would have to say no. Students who want to study politics and media are regularly instructed in how to identify propaganda and understand its use and functions, but teaching propaganda is not okay. Despite what radio talkshow hosts want to believe about the ‘liberal agenda’ on college campuses, the curriculum in most college classrooms is organized around teaching students how to judge fairly, practice ethically, and reason logically with no so-called political agenda in mind. The subject of those discussions is often negotiated by students and faculty, but the outcome of the process is not judged by some political agenda. I have never been judged, and nor have I ever judged my students, on the basis of their political beliefs. Classroom assignments (when done right) instead test the basis for those beliefs, and challenge students to apply fair, ethical, and logical methods of analysis to their claims about how the world is and how the world should be. This is what it means to develop critical thinking as a skill that can be applied to many different situations in life. I respond [Post 1/2]: I don’t know why you think my expertise or world-view is rooted in ‘book smarts’ alone. It is true that I read, and I do read a lot. I also work—I may teach college undergraduates right now, but I have also worked with other dishwashers, sandwich makers, and journalists. I show up to protests. I talk to people who are different than me, who work different kinds of jobs than me, and that live very different lives than I do because they live in a world that classifies them as ‘not-white’. To be clear, I do not think reading makes someone smarter; I do think, though, that reading affords everyone a unique position to make claims about the world outside of what they would normally know and learn from simply working and existing in the world. There are many different portrayals of the world, and there is no one that is more ‘accurate’ as world-view is in part determined by a person’s social, cultural, economic, and historical situation. To understand and appreciate many world views I read a lot of histories. 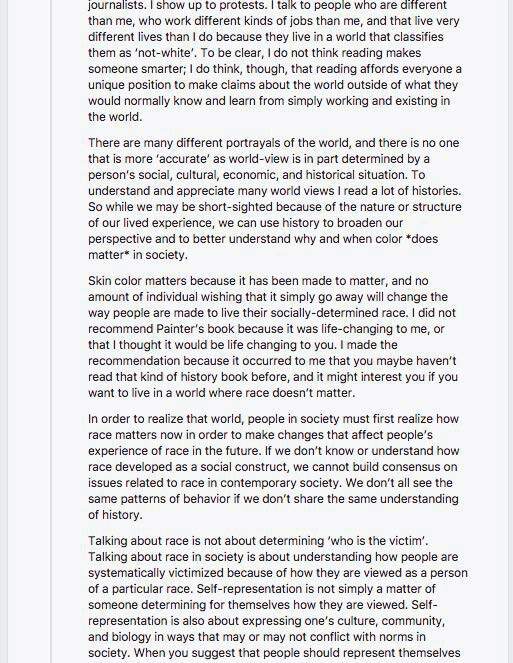 So while we may be short-sighted because of the nature or structure of our lived experience, we can use history to broaden our perspective and to better understand why and when color *does matter* in society. Skin color matters because it has been made to matter, and no amount of individual wishing that it simply go away will change the way people are made to live their socially-determined race. I did not recommend Painter’s book because it was life-changing to me, or that I thought it would be life changing to you. 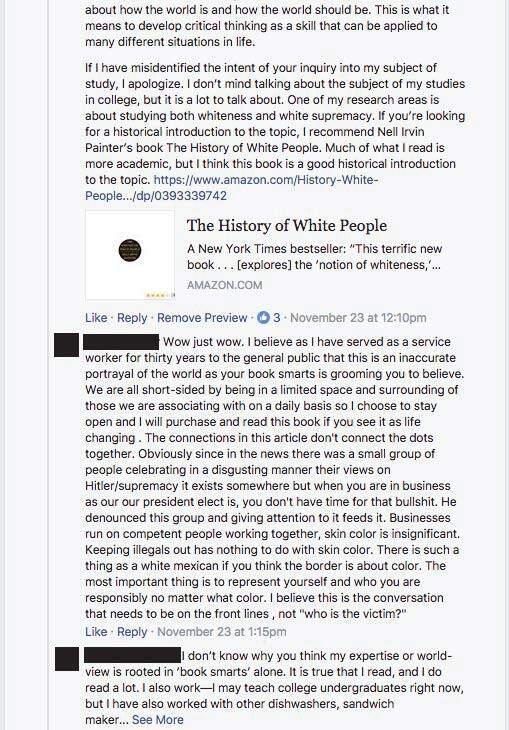 I made the recommendation because it occurred to me that you maybe haven’t read that kind of history book before, and it might interest you if you want to live in a world where race doesn’t matter. In order to realize that world, people in society must first realize how race matters now in order to make changes that affect people’s experience of race in the future. If we don’t know or understand how race developed as a social construct, we cannot build consensus on issues related to race in contemporary society. We don’t all see the same patterns of behavior if we don’t share the same understanding of history. Talking about race is about identifying when someone is vulnerable to racism; it is also about understanding how social norms and customs can have a history of affording people the right and way of exercising their race-based prejudices and biases. Immigration reform that only targets the migration patterns of a particular social group operates as race-based discrimination when other methods for curtailing the exploitation of undocumented workforces are not developed and executed by our government. Obviously there are both white and non-white people trying to immigrate or migrate into the US for purposes related to work, but equitable work documentation reform is something you and I would be subjected to on a regular basis. I respond [post 2/2]: You can make claims until the cows come home that immigration reform is not also targeting people of color, but your claims are not convincing to me when I read about border militias who sound and act like white supremacist organizations—who make judgements based based on an assumed race and nationality, who do not hesitate to enact violence or fantasize about committing violent acts upon people they would never imagine talking to (recommended reading: http://www.motherjones.com/…/undercover-border-militia…). 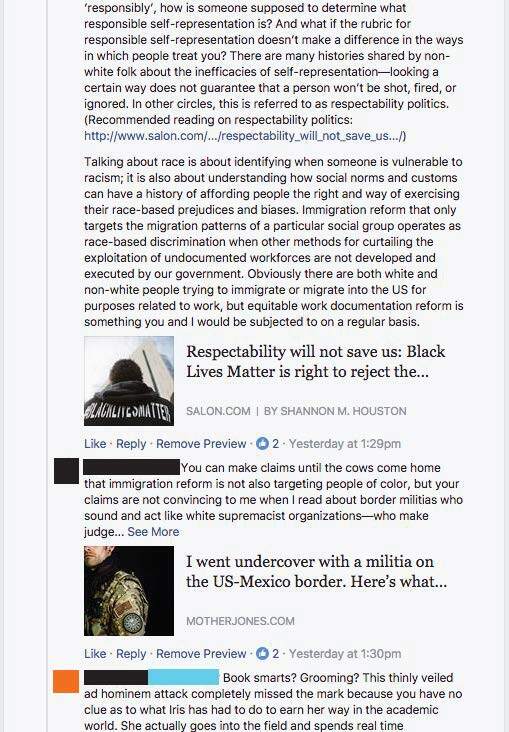 When the conversation around immigration reform does not address these militias as a problem that affects us all, then I’m not convinced the conversation is really about making our nation more safe or stable. I’m not sure what you mean by ‘the conversation needs to be more on the front lines’—the ‘front lines’ of policy reform happens in our legislative bodies, it does not happen on the border. Equating the border as the ‘front line’ of the Nation is like saying that the front line of our health is our skin—yes, it is the outermost barrier that holds things together for the body. But skins must be porous and allow for oxygen and other nourishing elements to come into the body. That is why bodies have immune systems (shared social and cultural practices, institutions) and people have doctors (researchers, specialists, experts, politicians)—because the skin barrier cannot simply be a wall that keeps all the bad things out. Bodies grow to depend on certain environments and the existence of certain resources—it is complex. Again, knowledge of history (and in this case, also knowledge of relevant codes, systems, and existing infrastructures) is useful for people in charge of maintaining balance between different things that are networked together. When we vote, and when we advocate for political and social change, we become those people responsible for knowing history. We cannot appreciate the significance of particular political acts without an understanding of the history those acts have in another culture’s world view. We cannot appreciate the irony of wanting to build a wall along the border of Mexico, for example, without understanding and learning about histories of immigration in the Americas, and how immigration has always been influenced by local farm and factory demands for cheap immigrant labor—labor that is so poorly compensated for that resident Americans refuse to do it. Labor that is so poorly compensated for that the people doing it still suffer immensely from the compound effects of low compensation, high costs of living, harsh work conditions, and more. Recommended reading: [Link]. From my point of view, these businesses that benefit from undocumented labor forces are not simply running on competent people—they operate because they are able to exploit a broken immigration system. It has been this way for decades—as an Oregonian you can read about the history of the Bracero Program to better understand what I’m talking about (recommended reading: [Link]). I think we can agree that the immigration system is broken; I do think it is a significant problem that so many people live in the United States without papers—it means they cannot contribute to the tax system for one. I do not, however, see acts that align with xenophobic beliefs to be valid suggestions for immigration or work documentation reform. And yet, xenophobia is exactly the basis for Kris Kobach’s policy suggestions for immigration reform. For the last 2 years we have heard Trump supporting policy suggestions that are xenophobic. I can only take your claim seriously that Trump does not align with white supremacists if I believe everything he has said and done for the last two years is a complete fabrication, an elaborate televisual performance intended to ‘dupe’ white supremacists into allying and rallying for his presidential campaign. I don’t think that’s the case. I think for decades Trump *as a business man* has relied on the normalcy of white supremacy and normalcy of exploiting people of color to make money. It is absolutely an aspect of how his businesses make money. If you are not willing to listen to the people who have been wronged by him—if they are all liars—then we need to talk about where you’re getting your information about his practices as a business owner. We need to be able to agree on a history of Donald Trump as a person, or we will forever disagree on what he is capable of as a leader of the Nation. Dillard replies: “Book smarts? Grooming? This thinly veiled ad hominem attack completely missed the mark because you have no clue as to what Iris has had to do to earn her way in the academic world. She actually goes into the field and spends real time with real people to learn and document their stories, and along the way she listens and learns. Here is a link to an original oral history documentary she produced back in 2013. The degree of institutional racism exposed in the oral history was both shocking and undeniable. 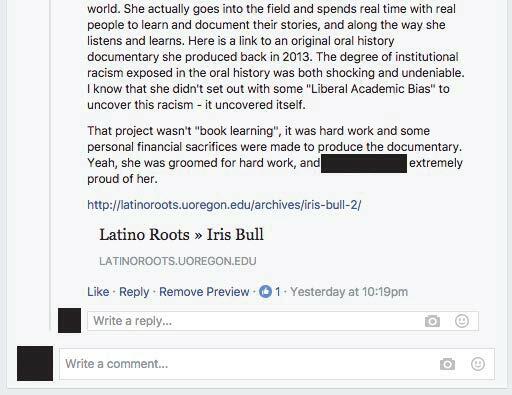 I know that she didn’t set out with some “Liberal Academic Bias” to uncover this racism – it uncovered itself. That project wasn’t “book learning”, it was hard work and some personal financial sacrifices were made to produce the documentary. Yeah, she was groomed for hard work, and [censored] extremely proud of her. [Link].